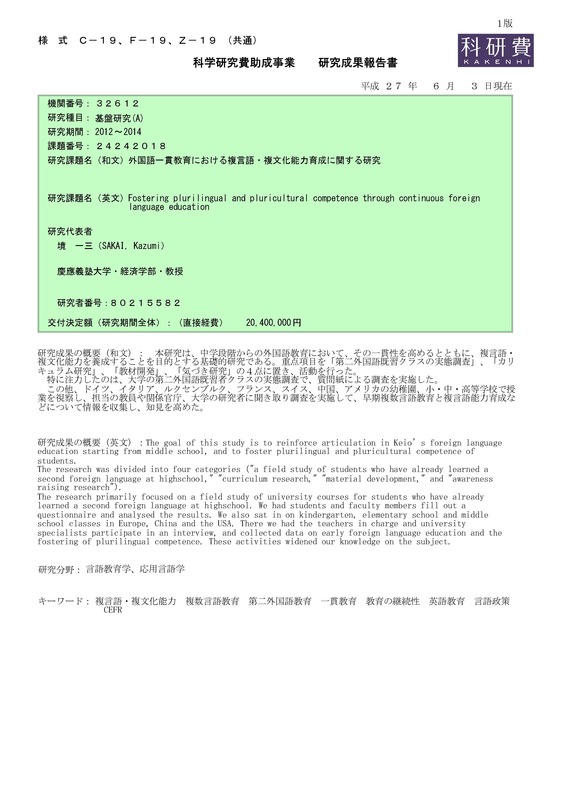 The goal of this study is to reinforce articulation in Keio's foreign language education starting from middle school, and to foster plurilingual and pluricultural competence of students. The research was divided into four categories ("a field study of students who have already learned a second foreign language at highschool," "curriculum research," "material development," and "awareness raising research"). The research primarily focused on a field study of university courses for students who have already learned a second foreign language at highschool. We had students and faculty members fill out a questionnaire and analysed the results. We also sat in on kindergarten, elementary school and middle school classes in Europe, China and the USA. There we had the teachers in charge and university specialists participate in an interview, and collected data on early foreign language education and the fostering of plurilingual competence. These activities widened our knowledge on the subject.